Sustrans is a UK sustainable transport charity. Its flagship project is the National Cycle Network. Sustrans works with schools to encourage active travel (cycling, walking or scooting) among students. It also works with employers and local authorities. It administers several thousand volunteers who contribute their time to the charity in numerous ways, such as cleaning and maintaining the National Cycle Network, enhancing biodiversity along the routes, leading walks and rides and supporting communities to improve their air quality. 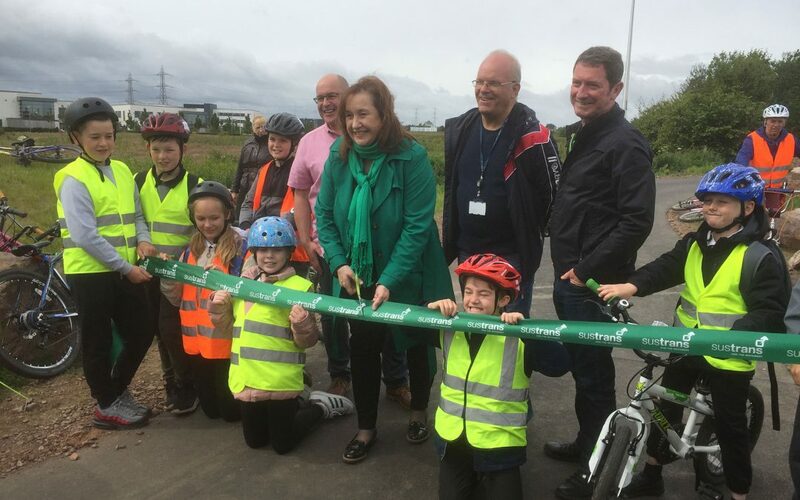 The newly created 8mile stretch between Gilmerton and Shawfair is just the start of a brand new cycle network connecting the South of Edinburgh and Midlothian. I have been commissioned to create a permanent sculpture group on the path along Gilmerton Station Road. Following my appointment for the cycle path commission, I attended the first public event. On 15 June the new cycle path was officially opened (see photo). It was a fun day with a lot of people on bikes! I am now meeting with a number of community groups to run workshops and conversations.